In this article we will see how to open datepicker on button or image click. In the other article we saw how to open datepicker on clicking inside textbox. 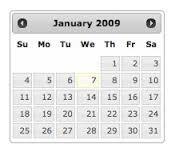 The default behavior of jQuery UI Datepicker control is to show Datepicker on click to the element to which it is bind. But sometimes it is required to open the datepicker control on click of button. In the view under script section, we have set the above properties, which renders a image next to textbox and on click of which datepicker opens. The showOn : "button" renders a image next to the textbox. On click of this image, datepicker opens. The buttonImage property accepts a image url which is shown as icon. By following steps we can open DatePicker on click of image or button instead of textbox.